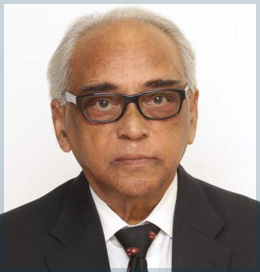 Dr. Kamalendu Malaker is a qualified physician from R.G. Kar Medical College at the University of Calcutta, India. He obtained his PhD in cell biology from the Imperial College in London and trained in Clinical Oncology at the University of Oxford. His training finished at the Royal Post Graduate Medical School at Hammersmith Hospital. Subsequently, he was appointed a senior registrar and clinical tutor for the University of London. Subsequently, Dr. Malaker moved to Canada where he headed the radiation oncology department at Cancer Care Manitoba and at the University of Manitoba in Winnipeg. His work continued as a research officer at the Dana Farber Cancer Center at Harvard University in Boston. Dr. Malaker’s expertise then took him to Libya in North Africa, where he was instrumental in developing radiation oncology services for the country and performed post-graduate training in clinical oncology for Libyan Board. He was consulting clinical oncologist for the Government of United Arab Emirate, and then assumed the role of chairman of The Princess Noorah Oncology Center in Jeddah, Saudi Arabia. Dr. Malaker’s career track also included the role of District Medical Officer in Sierra Leon in Sub-Saharan Africa, which impacted deeply in his future life. Dr. Malaker then headed to the Caribbean where he became Professor of Oncology at Ross University School of Medicine. Concurrently, he developed the oncology services unit for the Government of Dominica at Princess Margaret Hospital. In his present capacity, Dr. Malaker also carries the title of Director of Clinical Oncology at The Cancer Centre Eastern Caribbean in Antigua. Dr. Malaker’s interest in Keloids started in Oxford in the early 70’s while working with professor Frank Ellis, the pioneer of Clinical radiobiology. Dr. Malaker’s interest in normal tissue changes from radiation led him to study radiobiology of Keloids. He was the first one to devise interstitial and intraoperative brachytherapy, a standard he set for treatment of Keloids. He also worked out the optimal dose for primary radiation treatment of keloids, which is currently being used widely. Aside from many other original contributions, his current interest is the treatment of keloids with hypoxic cell sensitizers in combination with cytotoxic chemotherapeutic and other biological agents. A clinician, researcher, teacher, mentor, writer and director, Dr. Malaker he has left his legacy behind in every place he has worked. He has published more than 100 scientific papers and numerous books; one of which was a best seller for several years. His hobby of writing on travelogue, social issues, human right issues, climate change and many more, has produced more than forty essays and articles over several years. In recent years, he has successfully published popular titles such as “My Personal Health Record “, a manual personal health record compendium, and “The Plasma”, a medical thriller. His current interest is to develop equitable cancer therapy and management in countries with limited resources where eighty percent (80%) of the world’s population lives. While he continues to write on the human condition, he credits his vision and aspirations to his multi-racial and cross-cultural exposure through his work and travels. He still remains an avid global traveler and lives with his wife Baljit in Winnipeg, Canada. They have one daughter and two granddaughters.